Josh Hamilton and Omani Morales after regionals. The girls bowling team wrapped up a great season at state on Friday, March 2, where they placed 17th out of 18 teams. They had placed second at regionals, and won their conference. 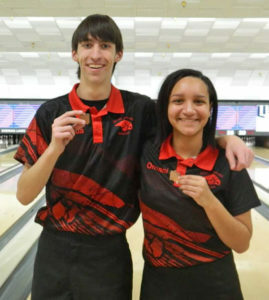 The Red Hawks also sent two individual bowlers to state. Sophomore Omani Morales, the top girls bowler in the region, was eliminated in the first round of individual competition, as was senior Josh Hamilton, who had finished fourth at regionals. Congratulations to you all on a great season!